Dhaka, 18 Mar, Abnews: Prime Minister Sheikh Hasina today asked the private medical colleges to give special attention to standard of education and curriculum to create quality doctors. "The private sector has come forward to establish medical colleges. But I think the authorities concerned should give special attention to properly maintain the quality of education and follow curriculum in these colleges," she said. 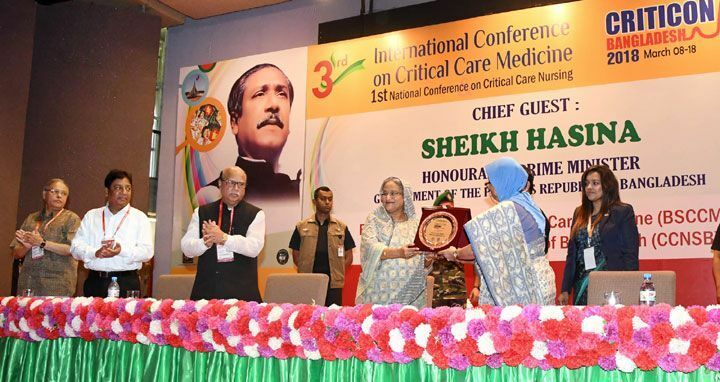 The prime minister issued the directives while inaugurating the 3rd International Conference on Critical Care Medicine and the 1st National Conference on Critical Care Nursing in the Krishibid Institution, Bangladesh (KIB) auditorium here this morning. The prime minister put emphasis on attaining higher education and training by the physicians to build quality doctors. "We want to send the doctors abroad for higher education and training ... my question is that if other countries can, why we cannot? Why our country will lag behind as we've not lack of knowledge and talents," she said. The premier, however, said there was dearth of scope for higher education as the country lacked medical university in the past. "Our government during the 1996-2001 tenure first established medical university and faced many obstacles while going to set up it," she said. Terming medicare service as a noble profession, Sheikh Hasina has urged the physicians to render treatment with the mentality of serving the patients like family members. "Medicare is not only a profession, but also a great motto of rendering services to patients ... So you have to develop a mentality of providing services and serve every patient as a family member, " she said. Bangladesh Society of Critical Care Medicine (BSCCM) and Critical Care Nursing Society of Bangladesh (CCNSB) have organized the conferences titled "Criticon Bangladesh 2018". Health Minister Mohammad Nasim, Bangladesh Medical Association President Dr Mostafa Jalal Mohiuddin and secretary of Health Services Division under the Health and Family Welfare Ministry Md Sirajul Huq Khan were present as the special guests. BSCCM President Prof UH Shahera Khatun presided over the function, while BSCCM Secretary General Dr ASM Areef Ahsan and Criticon Bangladesh-2018 Congress President Dr Mirza Nazim Uddin spoke. Laying importance on restriction of visitors at the hospitals, particularly intensive care unit (ICU), the prime minister said the relatives frequently visit the patients. She said the ministers and politicians think they must have go to hospitals to see patients otherwise their and patients' prestige will be hampered. "Even camerapersons enter the operation theatre with TV cameras ... why they will enter the operation theatre?" she said. About the ICU, Sheikh Hasina said entering the unit by the visitors is a simple matter now. "The ICU is such a place where patients with critical condition are admitted. But the visits of the relatives could harm the patient there and it is followed strictly abroad," she said. In this connection, the premier mentioned that now she doesn't visit critical patents at the hospitals and asked the hospital authorities to impose a strict restriction on the entry of the visitors of the patients to the ICU. Sheikh Hasina, however, highly praised the doctors and nurses working at the ICU with heavy risk and said they do the noble job like bringing patients with critical condition back to a normal life. The prime minister said many physicians are getting opportunities to utilise their skills and efficiency after completing MD degrees on critical care medicine from Bangabandhu Sheikh Mujib Medical University, Dhaka Medical College Hospital and BIRDEM. 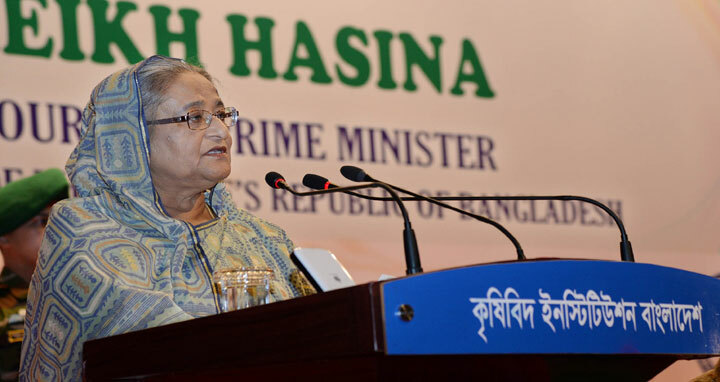 Sheikh Hasina also highlighted her government's strides for development of the health sector. She said her government implemented massive programs during the last nine years like formulation of a time-befitting health policy, recruitment of physicians, dental surgeons and health workers as well as setting up of community clinics to reach healthcare services to the doorsteps of the people. "Healthcare services are being provided to the people through telemedicine and mobile phone and it will be further developed after launching the country's first-ever satellite next month," she said. Noting the issue of autism, the PM highlighted role of her daughter Saima Wazed Hossain in creating worldwide awareness about the neurodevelopment disorder and said sincere efforts of Saima made it possible to bring this problem before the world community. Referring to Bangladesh's graduation to a developing country from the LDC Group, she said the UN recognition is a step forward towards materialisation of Bangabandhu's dream of establishing golden Bangladesh.